You wear the SnoreRX inside your mouth where it keeps your jaw thrust forward, opening your airway. 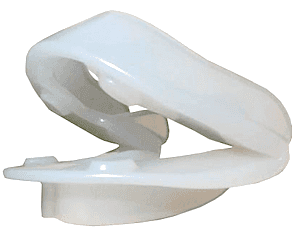 SnoreRX belongs to the classification of devices known as MADs (mandibular advancement device). The CPAP (Continuous Positive Airway Pressure) devices have an electric pump that forces pressurized air into your air passage to stop snoring. Users wear a mask that fits over their face or just their mouth. SnoreRX has no moving parts. 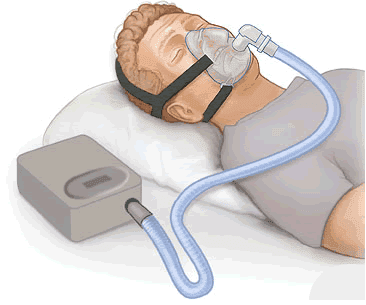 A CPAP has a small pump that you plug into any home AC outlet, hose, mask and filters. There are also battery-powered portable CPAPs. Doctors recommend CPAPs for patients with severe sleep apnea. You cannot buy a CPAP without a prescription. A SnoreRX can be bought over-the-counter. Each device does a good job in preventing you from snoring. The CPAP is simple to operate. The first time you use it you must assemble it by inserting the filter, connecting the tubing and adjusting it to fit your head shape. Once that is done, you only have to plug it in and turn it on. However, you must also disassemble it every morning in order to clean it properly. You use warm soapy water for the mask and tubes, and a damp cloth for the pump. Many users find that the dry, pressurized air dries out their throats too much and they need to upgrade to an auto-humidifying unit or purchase a separate humidifying attachment. If you do not go to a doctor and get a sleep assessment, you will need to fill out a self-assessment questionnaire provided by the CPAP manufacturer. The CPAP staff doctors will review your answers and if you are a candidate for one of the machines, write you a prescription. This generally means that it will take 2-3 weeks at least, once you decide you want a CPAP, to actually get one.The filter does not have to be cleaned every day but the mask and hoses need cleaning at least once a week if not every morning. Disassembling, reassembling and cleaning only take a few minutes.CPAPs have close to a 100% effectiveness rating to stop you from snoring. The odd shape of the SnoreRX may make you think twice before attempting to wear it. However, it is much easier to wear than it looks. The fitting process is easy. Once you go through the boil and bite and then use the Flex Jaw to tweak the fit, it feels like it was made for you. The Flex Jaw has an added bonus of letting you correct any mistakes you may have made in the boil and bite process, something many other MADs don’t have. Cleaning the SnoreRX thoroughly means you must disassemble it so that you can get into the hard-to-reach areas with your toothbrush. Once you do that, you can leave it in a glass of warm water with a denture tablet to ensure that no bacteria can grow. My wife and I followed the directions and made sure that the SnoreRX felt comfortable before we used it the first time. My wife must have adjusted hers perfectly as she woke up refreshed and without any soreness. My mouth was a bit sore, so I used the Flex Jaw to loosen it up a bit and the morning soreness did not reoccur. The device worked as advertised. Neither my wife nor I heard the other snoring during the night. My son confirmed that he could not hear any snoring though he went to bed after my wife and I fell asleep. The cleaning process took longer than expected. Taking it apart and scrubbing all the crevices with a toothbrush took some time. After the first few mornings though, it had become routine. 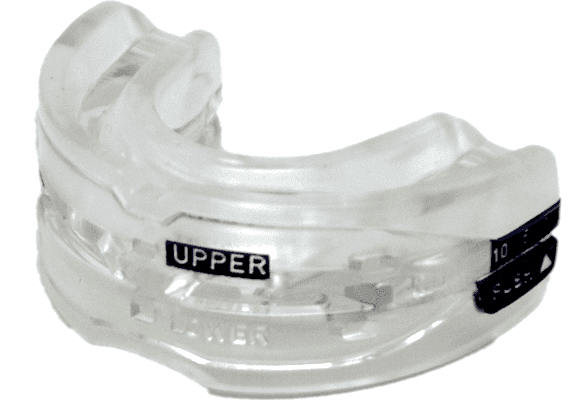 Unless you are a severe apnea sufferer, the SnoreRX will probably work fine for you. My wife and I liked the snug adjustment that the Flex Jaw gives you. The cleaning was a bit not as easy as some other MADs are but easier than cleaning a CPAP. The cost of a CPAP also can be fairly high. Often, however, your medical insurance will pick up part of the expense. If you do decide on SnoreRX, make sure to check for SnoreRX coupons.